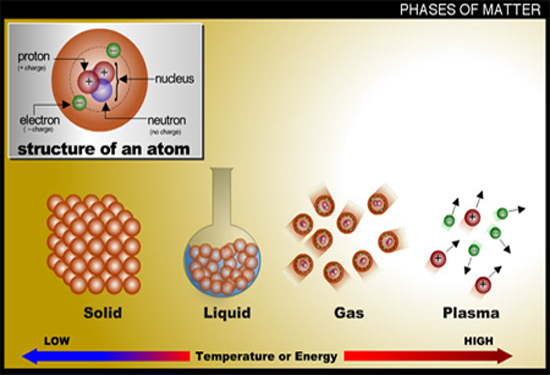 A Plasma is one of the four fundamental states of matter, the others being solids, liquids, and gases. See the illustration to the left. Plasmas have properties very unlike those of solids, liquids, or gases and are considered a distinct state of matter. Like gases, plasmas do not have a definite shape or a definite volume unless enclosed in a container. Unlike gases, under the influence of a magnetic field, plasmas may have some structure, such as layers, beams and filaments. Plasmas are a collection of conductive charged particles that exhibit whole body effects. But, plasmas also carry electrical currents and generate magnetic fields. A plasma is loosely described as an electrically neutral total medium of positive and negative particles (i.e. the overall charge of a plasma is roughly zero). It is important to note that although they are not "bound", these particles are not "free". When these charges move they generate electrical currents with magnetic fields, and as a result, they are affected by other magnetic and electric fields. This governs their collective behavior with a number of degrees of freedom. For a plasma to exist, ionization (the separation of electrons and protons) is necessary. 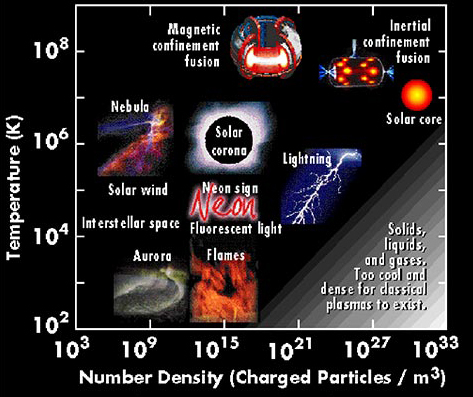 These charged particles must be close enough together that each particle influences many nearby charged particles, rather than just interacting with the closest particle (this is a distinguishing feature of a plasma). Plasmas differ from gases because of their great energy and motion. However, most terrestrial plasmas begin as gases. 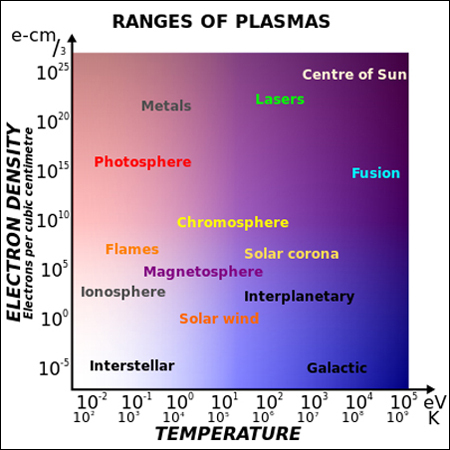 A plasma is sometimes defined as a gas that is sufficiently ionized to exhibit plasma-like behavior. Note that plasma-like behavior ensues after a remarkably small fraction of the gas has undergone ionization. Thus, fractionally ionized gases exhibit most of the exotic phenomena characteristic of fully ionized gases. Some say that 99% of the material content of the universe consists of plasma. This statement has the merit of being flattering to Plasma Physics and impossible to verify. Nevertheless, it is worth pointing out the overwhelming prevalence of plasma in the universe. In the early times of the universe, everything was plasma. At the present time, stars, nebulae, and interstellar space are filled with plasma. Our Solar System is permeated with plasma in the form of the solar wind. The earth is completely surrounded by plasma trapped by its Magnetosphere. Here are some examples of plasmas (see the illustration to the left). Note the coordinates are temperature and "plasma density" as defined above. Our sun is almost perfectly spherical and consists of very hot plasma in several layers of different densities and temperatures. The plasma permeates all layers and all elements are separated into free electrons and protons. Previously regarded by astronomers as a small and relatively insignificant star, the sun is now thought to be brighter than about 85% of the stars in our galaxy. Most of the Milky Way stars are red dwarfs. Chemically, about 75% of the Sun's mass consists of hydrogen, while about 23% is helium. The remaining 1.7% consists of heavier elements, oxygen, carbon, neon, iron, and a small portion of other heavy elements. The Core of the sun, about 25% of the solar radius, is the only section of the sun that produces heat. See the illustration to the left. The heat comes from fusion which is the conversion of hydrogen into helium. Fusion occurs when two hydrogen ions come close enough so that their strong nuclear forces exceed their electrostatic forces and they bind together forming a helium nucleus. A helium nucleus contains less mass than the two individual hydrogen ions and the excess mass is converted into heat energy. The fusion process transforms 4.3 million tons of matter (equivalent to 10 billion hydrogen bombs) per second into energy. The temperature of the core is about 15,000,000 degrees K. The rest of the sun is heated by the energy that emanates outward from the Core. 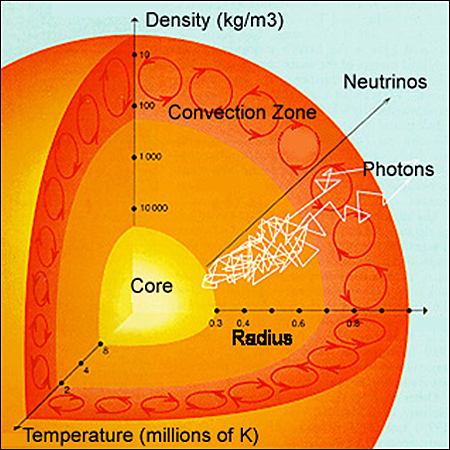 The Radiative Zone, from 25% to 70% of the solar radius, is hot and dense enough that thermal radiation transfers the intense heat of the Core outward by photon radiation. Very hot ions of hydrogen and helium plasma emit photons which are absorbed almost instantaneously in a few millimeters of the plasma and then are re-emitted again and again in random directions. This random radiation process takes a very long time for photons to reach the sun's surface as sunlight. The exact time is unknown, but the best guesstimate of the "photon travel time" is about 100,000 years. The Convective Zone, from the sun's surface down 30%, rotates around the sun as a normal fluid. The plasmas at the north and south poles slowly rotate in a circle around the poles taking about 33.5 days. The plasma convection currents speed up as they reach the sun's equator which rotates 24% faster in 25.6 days. 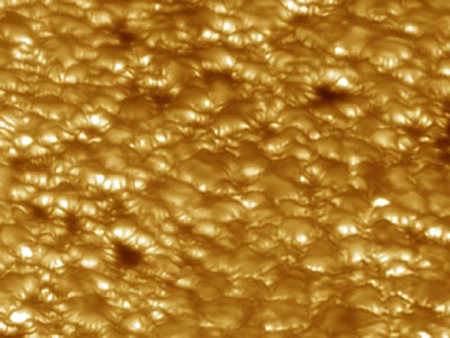 In the Convective layer, the solar plasma is not hot enough to transfer the heat energy of the interior outward through radiation. As a result, thermal convection occurs as thermal columns carry hot material to the Photosphere surface of the sun. Once the material cools at the surface, it plunges back downward. See the small circles in the Convection Zone in the illustration above. To the left is an actual photo of the Photosphere surface of the sun. The surface is very soft and granular, sort of like thick boiling tomato soup, but in this case it is boiling plasma at 5,800 degrees Kelvin. Gigantic blobs of matter, heated by the Radiative Zone below, rise to the sun's surface carrying heat with them. As these blobs of plasma emit energy into space at the sun's surface, they cool enough so that their density increases and they sink back down to the base of the Convective Zone to absorb more heat from the top of the Radiative Zone. The cycle then repeats itself over and over. Pictured at the left is the sun "puffing" plasma. Looking at the Corona (outer atmosphere of the sun) in extreme ultraviolet light we see some energetic jets and flares. The jets are localized, catastrophic releases of energy that spew material out from the sun into space. 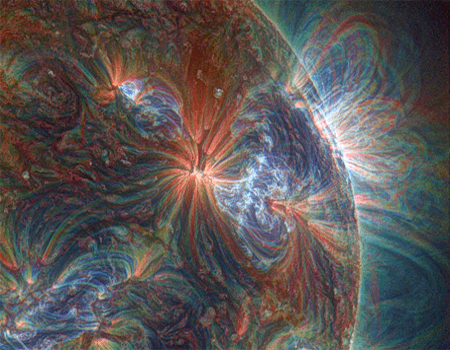 The three colors in the image - red, green and blue - correspond to three Coronal temperature ranges from 0.8 million degrees K to 2 million degrees K.
The solar wind is a stream of plasma released from the Corona of the Sun in all directions. It consists of electrons and protons with energies between 1.5 and 10 thousand electron volts (keV). The temperature and energy of the outer Corona is so high that the sun's gravity cannot hold on to all of it. The solar wind flows outward at very high speeds filling the Heliosphere, an enormous region of outer space dominated by our sun. Although scientists understand overall what is happening, they do not understand the details about how the Coronal plasma gases are accelerated to such high velocities. There are several proposed theories, but none have really taken hold at this time. The sun's rotation, a complete revolution every 25.6 days, causes its magnetic field to also rotate. The magnetic field rotation affects the Solar Wind, creating the Magnetic Current Sheet. The Magnetic Current Sheet is a humongous continuous magnetic wave of plasma particles throughout the Heliosphere. The spiral wavy shape, known as the Parker Spiral illustrated on the left, can be compared to a rotating lawn sprinkler, except that the waves keep growing until they encounter the Termination Shock at the end of the Heliosphere. sun (one AU equals the distance from the earth to the sun). The edge of our solar system is called the Heliopause which is where the Solar Wind and the Interstellar Wind pressures balance, and the Solar Wind completely stops. See the illustration to the left. 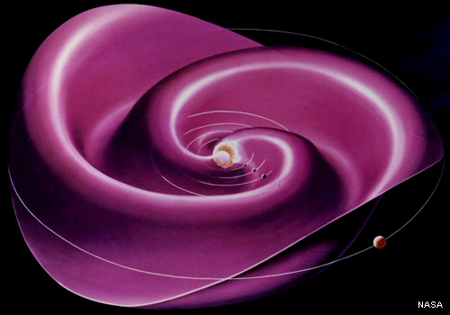 The area between the Termination Shock and the Heliopause is called the Heliosheath and is about 10 AU thick. The front of the Heliopause is roughly 100 AU in font of the sun. 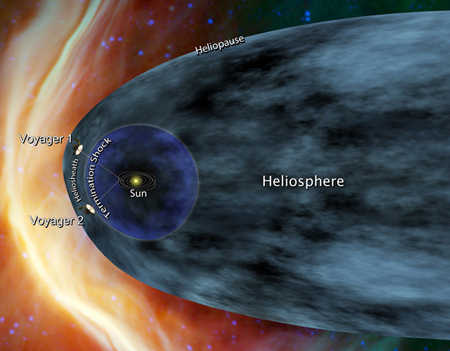 The rear is extremely far away as the Heliosphere has a very long tail similar to other star systems. If we translate the Latin word ‘nebula’, it means "cloud". 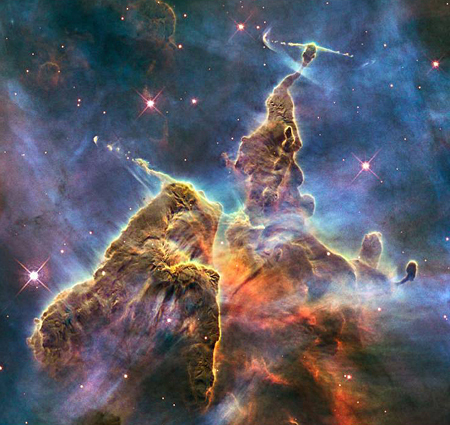 However, the nebulas that we are discussing, are much more than just a cloud. See the Carina nebula to the left. So what is an outer space nebula? A nebula is an interstellar cloud in outer space that is made up of dust, hydrogen and helium gas, and plasma. It is formed when portions of the interstellar medium collapse and clump together due to the gravitational attraction of the particles that comprise them. Outer space is not really a total vacuum (although it may sometimes be approximated as such). It is made up of plasma and dust known collectively as the interstellar medium or ISM. It is this dispersed matter that eventually collapses and forms a nebula. Parts of a nebula may may continue to clump together. The gravitational forces between particles is directly proportional to the their masses. So as the mass grows, so does the gravitational force. Thus, the more masses clump together, the greater their gravitational attraction will be to other bodies and particles in their vicinity. As the particles clump further to form larger and more massive structures, they attract more dust and gas. Immense clouds of hydrogen plasma and dust, called blobs, are larger than some galaxies and glow extremely brightly. 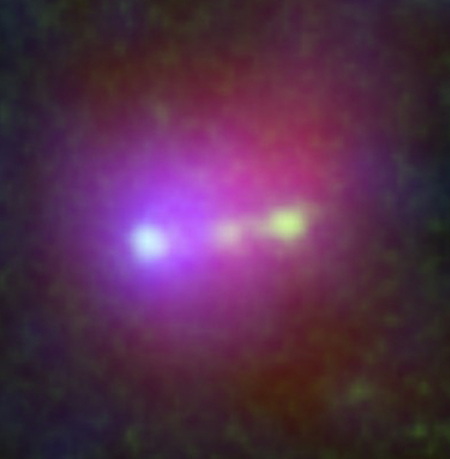 Lyman-alpha blobs (LABs) can reach diameters of four hundred thousand light years (more than three times larger than the Milky Way). These gigantic blobs emit radiation as powerful as the brightest galaxies. They are typically found at extreme distances so we see them as they were when the universe was about a billion or two years old. Where does the name Lyman-alpha come from? Answer - as an electron drops down from a higher energy orbit in an atom to a lower energy one, it emits light in the ultraviolet range. The photo emissions from electrons at the "two level" of hydrogen dropping to the "one level" measure 122 nanometers. This frequency line found in the gas spectrum is known as the “Lyman-alpha” radiation line, named after its discoverer, Theodore Lyman. A LAB is a huge concentration of hydrogen plasma emitting the Lyman-alpha emission line. Astronomers have spent years exploring the nature of a "mysterious" object called "Himiko" (pictured at the left) which is named after a legendary "mysterious" queen in ancient Japan. The observations reveal three primitive stellar clumps that are about to merge and form a larger object. These observations provide an important insight into the earliest phase of galaxy formation called the "Cosmic Dawn", when the universe was first bathed in starlight. Our Sun and Solar System is just one member of the Milky Way. The Milky Way is part of a system of galaxies known as the Local Group. The Local Group contains three large spiral galaxies: the Milky Way, Andromeda, and the Triangulum Galaxy plus a few dozen dwarf galaxies. The Local Group is a member of the Virgo Cluster. The Virgo Cluster is a collection of 1500 to 2000 galaxies that stretch across 15 million light years of space. And then, the Virgo Cluster is just one cluster in the Virgo Supercluster. Most galaxies are bundled into groups and clusters, although here and there one can find loners. Groups are smaller, usually made up of less than 50 galaxies and have diameters up to 6 million light years. For example, the Local Group, in which our Milky Way is a member, is made up of a little over 40 galaxies. Generally speaking, clusters are bunches of 50 to 1,000 galaxies that have diameters up to about 35 million light years. 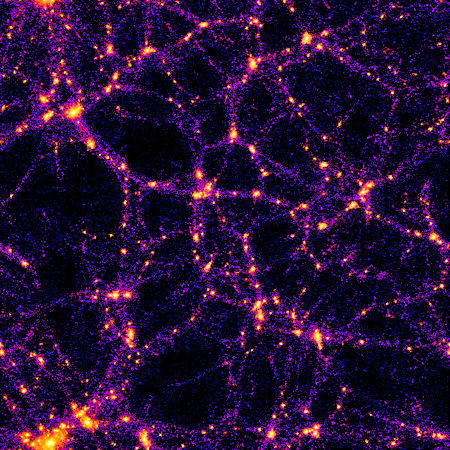 On the largest of scales, clusters are arranged into long filaments surrounding very large voids of space where there are almost no galaxies at all (see the computer simulation image to the left). One peculiar property of clusters is that the rotation velocities of their galaxies are too high for gravity alone to keep them bunched together - and yet they are. The concept of dark matter begins at this scale of the universe's structure. Dark matter is believed to provide the gravitational force that keeps clusters grouped together. Scientists believe that dark matter filaments are a remnant of the initial "plasma" fluctuations that dominated the universe shortly after the Big Bang. These dark matter filaments are very large and extremely long, like super highways that guide galaxies towards their ultimate destinations. Once a galaxy has joined a filament, it provides a guide path for the galaxy to join one of the "galaxy clusters" which are located at the vertices of the filaments. All the filaments are believed to be connected in a gigantic organized fashion called the "Cosmic Web".